Join us for another fun art class, The Masquerade! 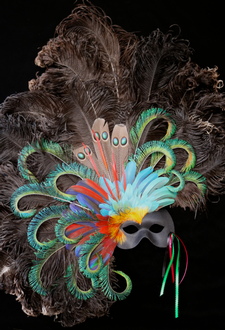 Using brilliant, naturally colored feathers collected over the past 30 years, participants will create beautiful mask masterpieces. During the 4 hour class, Lorra Lee Rose will cover the process from preparing the feathers to caring for your finished piece. Students will have access to many feathers not readily available to the general public and learn several interesting ways feathers can be manipulated to create depth and dimension. While selecting stunning colors and arranging them in a pleasing fashion, your final work will be suitable for hanging. $90/person, includes all materials and feathers, mask base, and necessary tools.